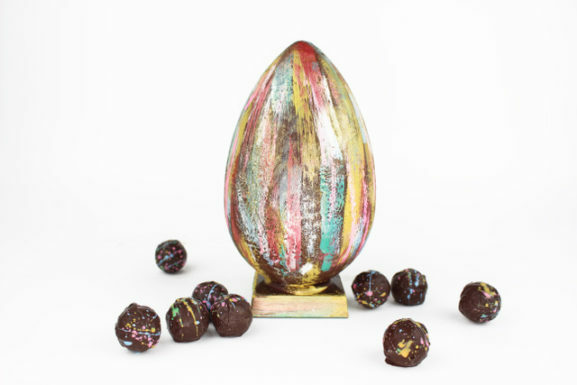 A Very Special Easter Egg and Truffle Making Masterclass - April 2019 - This event has now sold out. | Paul A Young Fine Chocolates. Event: A Very Special Easter Egg and Truffle Making Masterclass – April 2019 – This event has now sold out. Join us in our production kitchen for our special one off Easter egg making masterclass. Master the techniques and create by hand a stunning thick chocolate egg and create stunning truffles to hide inside. The hands on section of the day begins with a demonstration by our skilled Chocolatier of marble slab tempering, the vital skill to master and perfect so your chocolates will have a world class shine. You will also have the opportunity to master slab tempering and master moulding to create your egg. Preparation of your Easter egg mould, choose your decoration technique and how to create the perfect thick chocolate easter egg with chocolate stand. You will also create exquisite hand rolled truffles to hid inside your Easter egg and be shown how to present your egg in beautiful packaging ready to give to someone very special on Easter Sunday.